Mentioned is the way you can write. 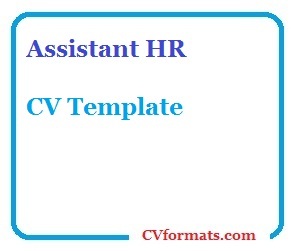 People looking for jobs can easily download these Assistant HR CV Template in word or pdf format or just view it online to copy and paste. Cover letter of Assistant HR CV Template is also available. Just change the name , address , qualification and experience and your Assistant HR CV Template is ready. To acquire a prestigious position in a growth oriented and dynamic environment where I can apply and refine my theoretical and practical knowledge for Corporate as well as my personal growth. 1. Tax Compliance (2 days training): AHLN, (A correspondence firm of RSM Int’l, Kabul. 4. English Language Course: Mardan Language Centre.